One of the more challenging things an actor must tackle in trying to be more intelligible in a large venue is dealing with the tendency for final, post-vocalic (after a vowel) continuants to disappear. It isn’t that the actor doesn’t say these sounds, it is more that the acoustics of the space and the distance between speaker and listener make it difficult for the sound energy to go that far. 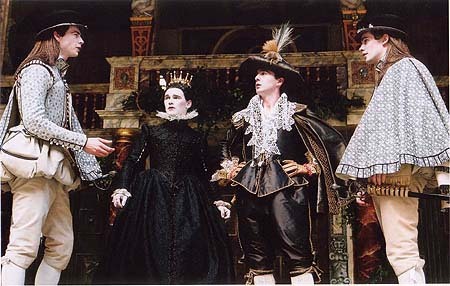 In a phrase like Orsino’s above, sounds like /f, v/, reportedly the two most challenging sounds in English for actors, must be enhanced in some way, or else we risk a phrase that comes off as “ih music be the food of luh, gimme excess of it,” which seems to cheat the poetry of this famous line, the first in Shakespeare’s Twelfth Night. In this case, the fabulous imagery of the language, the rich palette of sounds it offers, and the weight of setting out this thought as the thesis of Orsino’s first argument, all combine to offer the actor plenty of reason to relish the language, to indulge in its particular qualities. One might argue that the repeated use of /f/ in if, food, and of /v/ in love, give, of is a form of consonance, a poetic device where repeated use of a particular consonant is done intentionally by an author to catch the listener’s ear. Actors are well served to embrace these devices as their own, in a “I’m a poet and I don’t even know it” kind of way, or possibly, like a freestyling rapper, who knows how to improvise in this style, and is particularly “on” in this moment. You must justify your use of language, and “because the author wrote it that way” isn’t a good enough excuse! Iffff music be the ffffood ovvvvv lovvvvve, play on, givvvvvve me excessss ovvv it. Well, there you have it! It certainly IS possible to overdo it to the point of wrecking it! One thing this experiment did was to highlight what isn’t being done in this way. Did you notice how music and play on both seem to pop out because of their lack of these kinds of final consonants? I also noticed the possibility of relishing the plosion consonants at the end of music, and at the end of the phrase give me excess of it. Normally, I think we would be inclined to not release the /k/ at the end of music because it is going into the /b/ of be. And many of us rarely release final plosives at the ends of phrases, like the /t/ in it. Being fricatives, /f, v/ give us a little vibratory sensory feedback on our lips as we speak them, especially the /v/. Speak the text again, but this time, relish that vibration. Imagine that your feelings of unrequited love are somehow oozing out through those sounds, your aching heart throbbing in the vibrations of your voice. Ultimately we don’t want to be thinking about consonants and intelligibility while we are acting, we want to be lost in the moment, so try marrying the sound sensation with the imagery, the moment of the text. 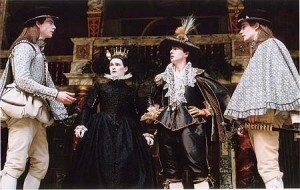 Now you might take a moment to speak all of Orsino’s first speech, and try to relish all the final continuants.